Bloggers last week shared news that iPad and iPhone shoppers accounted for 90% of all mobile purchases in December, according to a study by the ecommerce research firm, RichRelevance. The study also found that these shoppers spent 19% more than shoppers using Android devices. 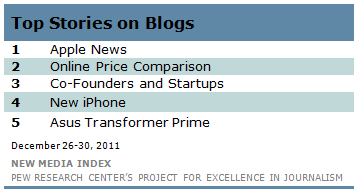 “If people are buying through mobile online retail sites, they’re most likely doing it on Apple devices,” wrote Darrell Etherington of gigaom, one of many bloggers to comment on and share the story which ranked No.1 on blogs from December 26-30, according to the New Media Index from the Pew Research Center’s Project for Excellence in Journalism. “Even though Android enjoys a healthy lead in overall global market share for smartphones versus the iPhone-no doubt a result of Android’s ability to exist on multiple devices versus the single iOS smartphone product line-it seems that iOS users continue to carry the day for mobile shopping,” wrote Powerhouse USA. Some bloggers put the data in their own terms. “In other words, 92% of 18% of a tiny sliver (3.74%) of total sales in the three weeks leading up to Christmas came from iOS devices. Not quite as impressive as the original headline suggested,” wrote iPhone News. Bloggers also discussed another ecommerce story last week. The No. 2 subject was a piece arguing that online price comparison sites are dying. According to the author, Paul Nikkel, “the golden days seem to be behind us as the old big names slump in traffic and value.” He cites examples like Pricegrabber and Kelkoo as examples of such comparison sites that either slipped in traffic rankings or were sold. Charlie Stross at Anti Pope saw this as more evidence of significant changes in online retailing. “And what are the long-term implications if, in 10 years’ time, the only way you can check the price of an item in a store is to point your camerphone at it-and the price will be tailored specifically to you and not available to anyone else?”* he wrote. And while this story didn’t delve into its potential impact on ecommerce, bloggers also shared news reported by the tech site BGR that Apple would launch a “completely redesigned iPhone in fall 2012.” The article, which ranked No. 4 for the week, claims that the new phone will be made out of a rubber or plastic material with an aluminum backplate. For months before the release of the iPhone 4S in October, bloggers speculated about its features and design-with many of the rumors proving untrue. This time, they took the news about the next incarnation with a grain of salt, not trusting Geller based on previous unfounded rumors he shared. “BGR has a mixed track record when it comes to hardware rumors, coming relatively close on Apple’s late 2011 iPhone lineup while missing with a claim of a redesigned WiMAX iPhone 5 exclusive to Sprint,” wrote Eric Slivka at MacRumors. “Of course, all of this is merely speculation at this point, as all Apple rumors are until the company actually decides to take the stage and announce something. So those of you hoping for a redesign shouldn’t be excited just yet,” wrote Adam Mills at Gotta Be Mobile. At No. 3 was a slide show from Mashable that showed how co-founders from popular startup companies met each other. The startups covered in the piece included Warby Parker, Rent the Runway, Foursquare, Sugar Inc., Spotify and several more. For example, the founders of DNA 11 met in kindergarten and two of the founders of Airbnb met when they became roommates through Craigslist. In fifth place was discussion of the Asus Transformer Prime, a tablet deemed “fabulous” by Hubert Nguyen of Ubergizmo in his November review of the device. The Asus Transformer was the top story on blogs December 19-23 and December 5-9 and bloggers seemed to agree with the rave reviews. An array of popular singers dominated the conversation on Twitter last week, with a story about upcoming tech trends also causing a stir. 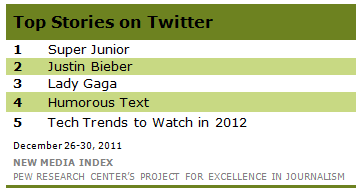 In first place was Super Junior, a Korean pop group, and one of its singers, Siwon Choi, who happens to tweet in En glish. The band was the No. 2 story on Twitter the week of August 29-September 2 when another member of the group, Heechul, enlisted in the South Korean army. Discussion this past week revolved around the group having the first-ever album to rank No. 1 nine consecutive times on the Filipino charts and its fans not being informed in advance of a recording. Tweeters also heavily retweeted photos that Choi took. At No. 2 on Twitter was perennial favorite Justin Bieber, including video of him performing Christmas songs at the Disney World Christmas Parade. In the YouTube video, Bieber sings Mistletoe and Santa Claus is Coming to Town. An audio clip of a Lady Gaga song came in third place on Twitter and a humorous image of text conversation was the No. 4 most-discussed story on the social media outlet. At No. 5 on Twitter for the week was a Mashable article about five tech trends to watch for in 2012. Those trends included a micro-payment economy, where one makes money selling tiny items with incremental upgrades; an increased number of light, thin and powerful laptops; and what the article calls “social/digital exhaustion” or people reevaluating their social existence online and dropping off of Facebook, Twitter and Google+ for a variety of reasons. The majority who retweeted the article did not opine on it, but those who did had a mixed response. “No geek’s talk required. Just relevant to most of us here,” tweeted rudileung. “Ok. Now I am officially – scared,” wrote Luann Lee. “Interesting –> Several will impact #mrx” wrote John Tomas, referring to market research. The most popular news video last week was of the delivery man from hell who was caught on a surveillance camera throwing a computer monitor over a fence. The only difference in the top five news videos on YouTube last week was their ranking. The No. 1 video last week, the FedEx delivery man, was No. 2 the week of December 17-23. That pushed the footage from North Korean state media of people crying over the death of Kim Jong Il to the No. 2 spot, after it had been the most-viewed video one week earlier.